Armagh manager Paul Grimley has brought five new players into the squad for the Ulster SFC clash with Cavan on 8 June. Silverbridge's Seamus Kelly, John McGill from Carrickcruppen and Grange player Míceál McKenna come in. The trio are joined by goalkeepers David O'Hagan (Grange) and Tim Harney (Pearse Og). "Bringing in these players is in line with our policy of new younger players for the future," said Grimley. Harney is a former Tyrone All-Ireland Minor winner and played in the MacRory Cup with Omagh CBS. The Dergview soccer player only transferred to Pearse Og's, his father's former club, last year. 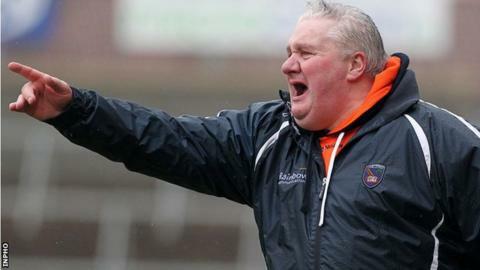 Armagh are looking to bounce back after their relegation to Football League Division Three earlier this month. "The players have put the recent league campaign behind them and we are starting our championship training," added Grimley. "Myself, the management team and the players want to thank our supporters for their great backing throughout the league and we are determined to extend the summer season as far as possible."